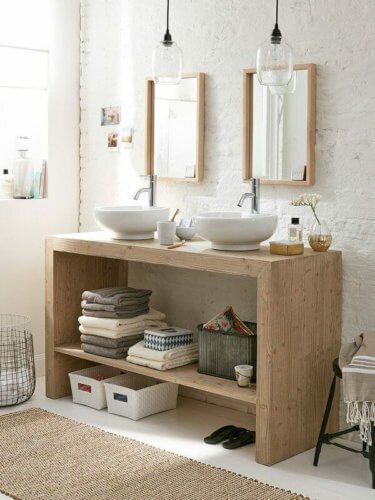 While you may not be able to change the physical size of your bathroom, you can certainly transform it into a space that will look and feel modern and spacious. 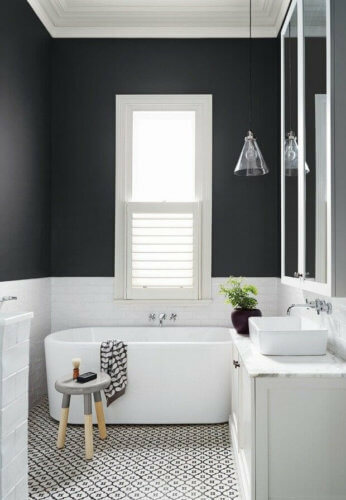 Armed with the right paint colors, decor accents, fixtures and a strategic vision, your small bathroom can become the highlight of your entire home. Remodeling a bathroom is particularly important if you are trying to sell your house. A nice bathroom is a top selling point for most people, and they want to see a beautiful updated space. The good news is that in a small space, you don’t have to spend thousands of dollars to achieve the desired look and feel. Everything from labor to materials is a lot cheaper compared to a large or master bathroom. A budget of around $5,000-8,000 can go a long way in a small bathroom. Here are the 10 best design tips for renovating a small bathroom, to kick start your makeover. A shower curtain is one element that can drastically diminish the appeal of a small bathroom. It makes the room look dated, while also creating a visual separation between the shower/bathtub space and the rest of the space, making it appear half its real size. Framed glass doors also look heavy and divisive. 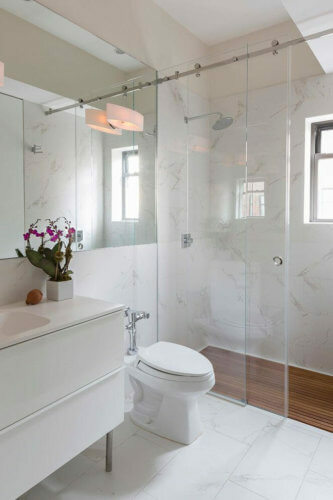 The optimal solution for improving the design of a bathroom that has a shower is to install frameless glass doors. These will create a seamless, continuous look from wall to wall, visually enlarging the space. There are numerous options available, from sliding doors, to those that open up in various directions. If you do not actually use your bathtub, consider removing it completely, and installing a shower enclosure made of glass. These can be either prefabricated, or custom-made to your specifications, if you feel like splurging. This will completely transform your space, giving it a luxury spa-like look and feel. If you want to open up your bathroom space, the first thing to replace are the old, bulky cabinets that leave no breathing room. Luckily, today there are plenty of stylish cabinets to choose from, that will not only add inches of precious space, but will also offer smarter storage solutions. To visually add height to the walls, consider installing floor to ceiling cabinets. Floating cabinets or shelves are an attractive and effective storage solution that saves space. Another idea is to use under-sink storage and towel bars to free your counter-top of clutter, for a cleaner, more spacious feel. In recent years storage ladders have become very popular. They add a unique designer touch, while offering ample storage. 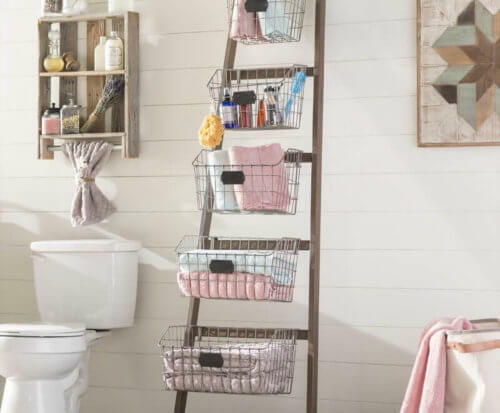 Keep in mind that a storage ladder takes up more space than other types of shelving, so if your bathroom is really tiny, this may not be the best solution for your needs. If you are into DIY remodeling, and want to create a rustic or country style bathroom, consider using old wooden crates for storage. They can be stacked from the floor or nailed to the walls. You can either paint them using bold colors, or leave the wood exposed. The best part is they will not cost you anything. Many large stores are happy to give them away for free! Interior designers commonly use mirrors to create an illusion of a big space. Install a large, frameless mirror along one of the bathroom walls, and kiss the claustrophobic feeling in your bathroom goodbye. If you have a small powder room, or a bathroom that is used primarily by females, having large mirrors can greatly help in deciding on different outfits, as well doing hair and makeup. Huge, floor to ceiling mirrors that span the entire wall offer a stunning effect. However smaller mirrors that begin at the height of your vanity and go up to the ceiling work just as well. In terms of prices, size, design and shape make a big difference. Large 42″ frameless mirrors can start at around $250. Mirrors that are 60″ and over cost $600 and up. Fancy frames can increase the price to as much as $2,000+. A sure way to dramatically transform the look of your bathroom is with tile. 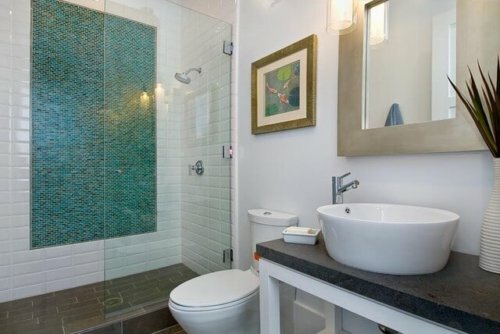 One design tip for small bathrooms is to put in oversized tile, such as 30×30. These large surfaces and minimal amount of grout lines will make the space appear much larger and airier. Where should these tiles go? To achieve the best visual effect, consider doing floor to ceiling tile of the same color (preferably light) throughout the bathroom. Moreover, by keeping the tile the same size and color both on the walls and on the floor, you create an illusion of seamless space, without dividing lines that visually cut up the room. Another great way to create a sense of space and height is to install your tile vertically, rather than horizontally. 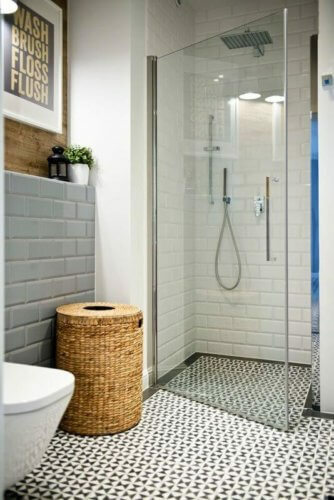 For a unique and modern look, go for glass tile. Ceramic and porcelain offer a more traditional aesthetic, while natural stone tile brings a sense luxury. 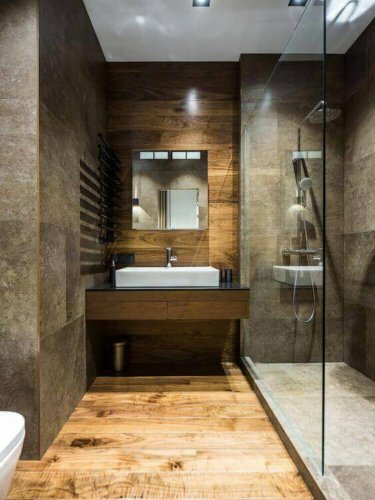 One of the hottest trends is to install wood look tile in bathrooms. The look and feel of natural wood can create a very relaxing and comforting atmosphere. However, since real wood and moisture don’t do very well together, tile manufacturers started making gorgeous ceramic and porcelain replicas of popular wood species. Depending on the brand and quality of tile, you can spend $3 – 12 per square foot. If you are really not into the idea of huge tile all around your bathroom, another possibility is to install one or two bands of smaller size colorful tiles that span the entire bathroom. These bands attract the eye, taking it all around the room, and making it appear visually larger. When selecting your tile keep in mind the material’s slip and moisture resistance. Safety is the Number 1 priority in a bathroom, especially if you are remodeling a space that will be used by children or elderly individuals. A single, ceiling mounted light fixture makes the bathroom look dated and offers the least amount of visual interest and functionality. Moreover, a dimmly lit space will actually appear smaller and all fixtures and paint colors will look worn out, even if they are not. Instead, consider installing recessed lighting, as well as task lighting above the vanity. You can get creative and put in fixtures that make an attractive focal point. Different types of lighting in one space will create an overall brighter and therefore visually bigger bathroom. Avoid using fluorescent lights. They tend to look depressing and also add an unnatural tone to your real skin color. The beauty and special advantage of remodeling a tiny bathroom is that you can break many design rules and play around with colors and patterns that would look “over the top” in a larger space. By incorporating eye-popping details, you take the focus away from the square footage of your bathroom, and create a unique room that is all about experience, rather than size. Get creative and include elements that speak to your personal aesthetic. Consider bright splashes of tile, bold color choices, interesting patterns, unique shapes and materials for your vanities, catchy lighting fixtures, etc. In recent years, using moisture resistant, designer wall paper has become very popular. There are many colors and patterns to choose from. Don’t be afraid to use large, bold prints and patterns. 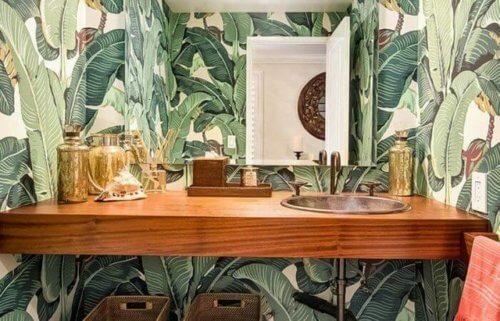 Today, one of the hottest trends is banana leaf wallpaper (image above) that exudes the feel of an exotic island getaway. Overall, wallpaper looks fabulous in small bathrooms, and can really bring out the character of your space. Rustic, farmhouse, as well as contemporary style bathrooms can benefit from an accent wall adorned with beautiful wallpaper. 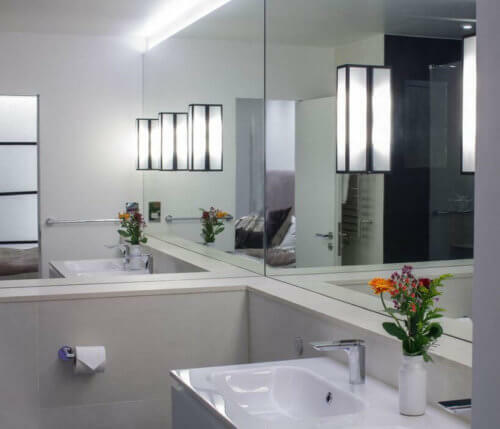 One of the key elements to successfully redesigning a bathroom is to evaluate which fixtures take up too much space and replace them with a smaller alternative. Typically, older homes have very large vanities that are not very functional. Instead, consider installing a tall pedestal sink, a console or a wall mounted sink that matches the overall style of your bathroom. Today, there are many design options to choose from, ranging from the minimalist and ultra-modern, to traditional, old-world charm sinks. Color can really break or make your bathroom. You can play it safe, and use neutral earth or ocean-inspired tones typical in larger bathrooms. However, a small space will not gain much from this. On the other hand, you can reinvent your bathroom by using brighter and bolder colors, such as deep hues of red or orange. Surprisingly, dark colors such as charcoal and black can also be a great choice, especially if you are going for a contemporary look. Since the room is not very big, don’t be afraid to experiment with a color you really like. It will be quick and inexpensive to repaint, if it fails to meet your expectations. One effective way to use color is to only paint some of the walls. For example, you can tile the shower walls, and paint the walls outside. Another popular design is to tile or use paneling on the first half of the wall, and paint it from the ceiling up. The best way to add a sense of light and airiness to your bathroom, is to use white color on your walls and flooring. This simple idea works wonders in particularly small bathrooms that seem to have no breathing room to give. Best of all, an all white bathroom will never go out of style. It has a classic appeal that most people naturally gravitate to. 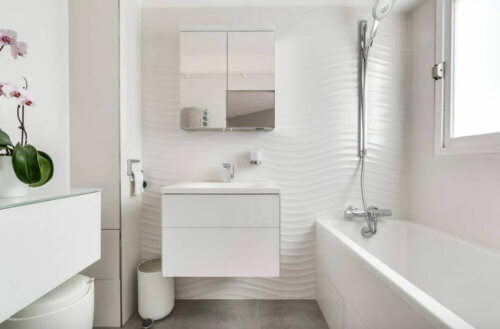 If you are planning to sell you home and want to update a small bathroom, going for the white or off white design is a sure way to attract positive attention from prospective buyers. Another great benefit is that most white color materials (paint and tile) can be significantly cheaper than their brighter counter parts. So not only will your bathroom look refreshing, you can also save a few hundred dollars along the way. If an all white bathroom does not suit your tastes, you can add some color through accessories, pictures, plants, vanity, towels, etc. 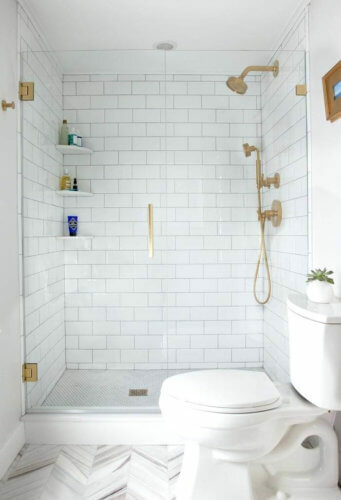 For example, we love the gold color fixtures featured in the bathroom above. In fact, in recent years, gold, rose gold, champagne bronze bathroom fixtures have replaced the tried and true look of stainless steel and chrome. If you want to keep your bathroom renovation budget and efforts to a minimum, and still make a big visual impact, consider adding an accent wall in your shower. In a tiny space, a tile accent wall will instantly become the focal design element. It will take attention away from all other imperfections of your bathroom. This can be a great opportunity to experiment with a new look for your bathroom without making any huge changes. Consider arabesque style tile shapes, bright encoustic patterns, colorful glass designs. Alternatively, you can go for a more natural look of stone and install marble or granite tile, which will create a very upscale feel. If you are doing a complete bathroom remodel you may have the option to insert a built-in shower niche. They can either be custom built, or purchased from a Home Depot or tile store in prefabricate size and shape. A shower niche is highly functional, because it takes away all the visual clutter from your bath or shower area. 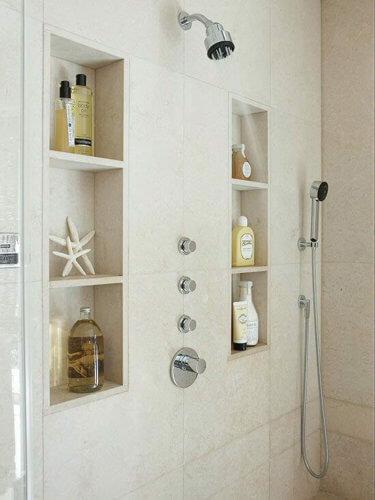 You can store all your shampoos, lotions, soaps, etc in these build-in shelves. Another benefit is that you can position them pretty much anywhere on the wall, at a height that is convenient for you. 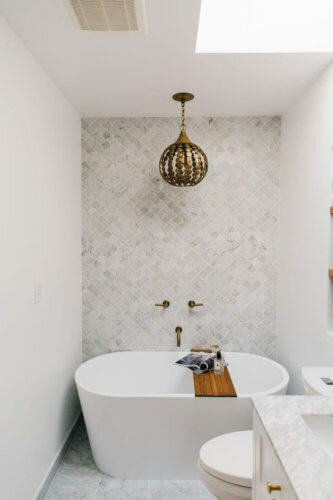 Moreover, you can tile these niches with materials and colors that are different from the tile used throughout the bathroom, and create a beautiful accent. Best of all, this is not a very expensive addition: a prefabricated niche costs $50-65 depending on the size. 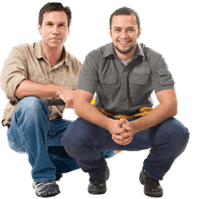 Asking a contractor to build it to your specifications can run $250+ per niche. Glass has made its way into our bathrooms in the most unexpected ways. However, its a welcome innovation particularly for small spaces, because it creates a sense of openness that other materials cannot compete with. 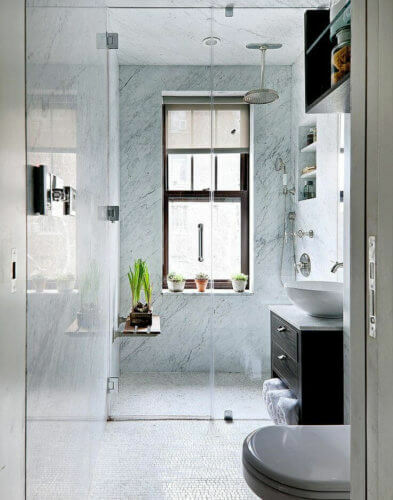 From glass door shower enclosure, glass wall and floor tiles to glass top surface counters, vanities, faucets, shelves and sinks, you can incorporate this versatile material into your bathroom design as much or as little as you want. A bathtub can look very bulky and old-fashioned in a small space. From a particular standpoint it also takes an enormous amount of much needed floor space, making storage more challenging. As mentioned before, the simplest solution is to get rid of the tub all together. In fact, that is what most homeowners do if, they have another bathroom with a tub. 1. If you have a standard acrylic tub, use the walls around it to build storage shelving. 2. Consider replacing the old tub with a sleek looking stand-alone tub. These can be made of resin, cast iron, wood, etc. 3. Choose a unique tub color. Many stand alone tubs come in various bold hues: red, blue, black, green, etc. Such a tub can become a unique accent piece and make your bathroom look very stylish. In a very tiny bathroom, where every inch of space counts, a traditional toilet or vanity can take up too much room. To solve this problem, and make the room appear more airy, consider a floating toilet, or vanity, or both. These have a minimalist and modern aesthetic and are ideal in a contemporary style bathroom. Still, if you are trying to save space, they will make a great fit any style bath. Big brands such as Kohler and American Standard have numerous models to consider. 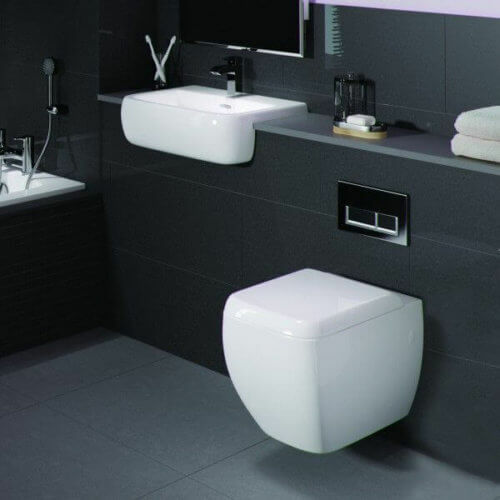 However, the Japanese brand, TOTO, is best known for their stunning designs that make a regular toiler into a real piece of beauty. One of the least visible elements of the small bathroom is the floor. There is usually so much different stuff placed on top of it, that there is barely enough room for one person to stand. By de-cluttering the floor, you instantly create the effect of a much larger space. Moreover, a visible floor creates a perfect design opportunity: you can use beautiful tiles to bring character to the space. – continue the same flooring material from the main floor into the shower. This will create a seamless look without interruptions and make the room appear bigger. First of all, I would like to thank you for posting such a helpful blog for homeowners who suffer from small spaces. Bathroom and kitchen spaces, if small, lead to a messy look due to difficulty of proper storage. Many of the ideas shared in this blog are new and unconventional from the common ones we know about. There is a scope to also improve the beauty of the area along with space solutions in each of the ideas shared. Oversized tiles and big mirrors are new to my knowledge and will soon try to implement them during my bathroom renovation. Sometimes even bathroom remodelers can also be instrumental in helping us with innovative space enhancing designs.